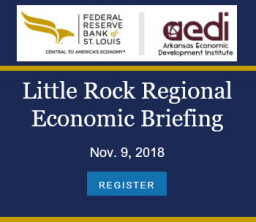 The latest information on Arkansas employment and unemployment was released by the U.S. Bureau of Labor Statistics and the Arkansas Department of Workforce Services this morning. The report showed encouraging signs of continuing improvement in the Arkansas labor market. The unemployment rate ticked down one-tenth of one percent to 7.4%. The household survey also showed that the number of unemployed persons fell by 1,800 in July, dropping below 100,000 for the first time since May 2009. Analysis of the payroll survey is complicated by seasonal patterns. Without seasonal adjustment, the data show employment down by nearly 11,000 in July. However, as shown in the chart below, July is typically a low-point in the recurring seasonal cycle diplayed by employment data. (See Seasonally Adjusted Unemployment Rates for Arkansas MSAs.) After seasonally adjusting the raw data, the statistics from BLS show that payroll employment rose by 3,600 jobs. Since the end of 2009, payroll employment has increased by nearly 16,000 jobs. The increase was broad-based, with increases in every major sector except financial services and government. Employment in manufacturing showed its 7th consecutive monthly increase. Trade, transportation and utilities was up by 900 jobs, and business and professional services rose by 1,400. Education and health services continued to expand, adding approximately 2,400 jobs in July. The decline in government employment can be primarily attributed to layoffs of temporary census workers. Typical summer doldrums aside, the July employment report provides additional evidence that labor markets in Arkansas are steadily improving. Table – Seasonally Adjusted NFPE.